Telstar is set to showcase Lyogistics Zero automatic vial loading and unloading system for freeze-drying processes at Interpack event in Germany. Lyogistics Zero system has been developed for pharmaceutical freeze-dryers and incorporates a steam-sterilizable slider with no concealed parts that can be moved by a contact-free magnetic drive mechanism. The next generation automatic vial loading and unloading system can be can be cleaned (CIP) and sterilized (SIP) in place and inside the freeze-dryer chamber. Lyogistics Zero system allows the transfer device or slider to remain in the chamber from where it undergoes cleaning and sterilization along with the internals of the freeze dryer. The absence of mechanical links between the drive and the slider helps the system to work effectively, while the integration of passive magnetic drive enables to reduce the risks with asepsis caused by the presence of mechanisms such as belts and bands and electrical equipment such as cables and batteries. Lyogistics Zero, which is suitable for use in production processes involving hazardous products, can be incorporated within aseptic isolators that need high level protection for the operator (OEL5), product (ISO5) and environment. The company will also present latest developed solutions in isolation technology systems, sterilization, water and pure steam generation, and pharmaceutical freeze-drying applications at the event. 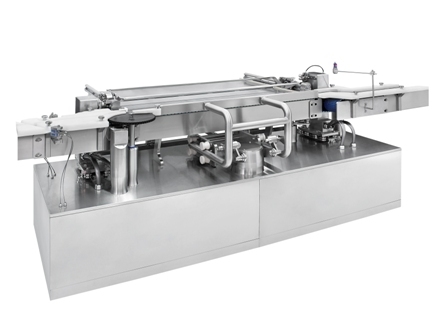 Image: Telstar to showcase Lyogistics Zero automatic vial loading and unloading system at Interpack event. Photo: courtesy of Azbil Telstar, S.L.